“How do I measure the accuracy of my rifle?” is one of the questions that is eventually asked by most shooters. Unfortunately the answer isn’t as straight forward as it may seem. Measuring the accuracy of a rifle or other firearm is really a combination of two factors, the precision of the rifle and ammo, along with the skills of the shooter. Let’s take a look at both. “Precision” measures how consistently the rifle places each shot on the target. Precision is measured from the center of each bullet hole and us usually stated in MOA (minutes-of-angle). One MOA is 1.047″ at 100 yards and is usually rounded to 1″. The most common test is to fire several three or five shot groups and measure the distance between the two farthest holes in each group giving the CTC (center-to-center) group size. Mean radius and standard deviation calculations are less common but generally considered to be better indicators of precision. Many factory hunting rifles are capable of 1.5 MOA, or better precision using premium hunting loads. Custom target rifles with hand tailored loads can go under 0.5 MOA, and the best benchrest setups are consistently under 0.2 MOA. “Accuracy” is a combination several factors, firearm precision, sight adjustment, and the shooter’s ability to consistently break the shot. For practical purposes, accuracy measures whether the shooter can place the shot so it hits the intended target. And accuracy requirements can vary greatly, from the 10″ vital area of a whitetail buck at 100 yards, to the 5″ X ring of an F-Class target at 1000 yards. For the shooting system to be considered “accurate”, the firearm must have the precision to consistently hit the target. Then the sighting system must be adjusted correctly so the shots fall in the middle of the target. And lastly, the shooter must be skilled enough to break the shot on target, whether from the bench or in the field. The OnTarget Precision Calculator program is used to measure both precision and accuracy of the firearm. The precision data presented for each group includes the CTC measurement, mean radius, and horizontal and vertical group extents. In addition, the group offset measurement helps the shoot adjust his sights to center the group at the point-of-aim. 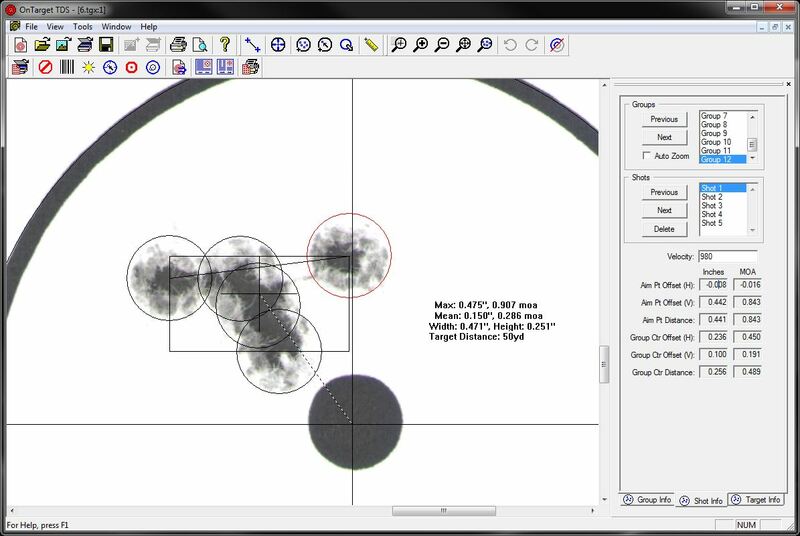 For the shooter requiring more in depth data, OnTarget TDS provides standard deviation and CEP calculations for individual and combined shot groups. Once the firearm is set up correctly the shooter can continue working on his or her technique to maximize their shooting performance.